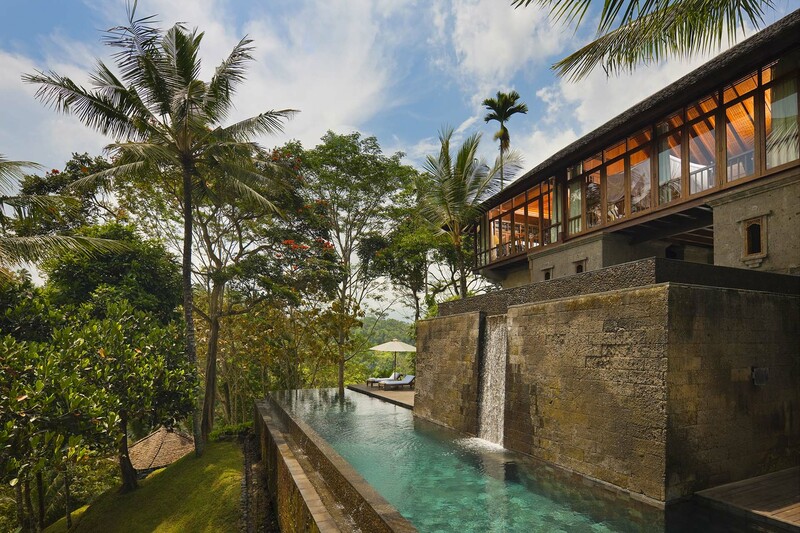 Imagine having your own private villa perched on a stunning ravine overlooking a river valley and surrounded by jungle. You wake up in the morning and watch the mist rise off the river, dine on your own private outdoor patio next to the pool and recline in luxurious open rooms open to the gentle tropical breeze. 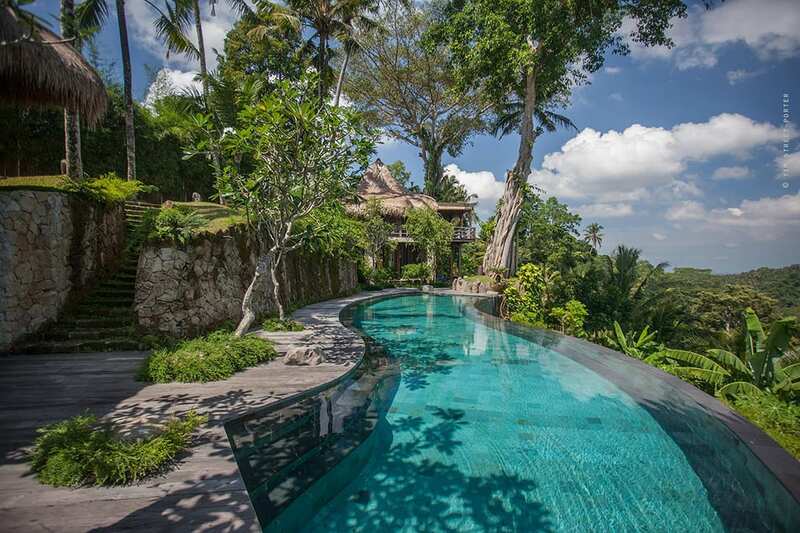 Welcome to Villa Shamballa, an intimate private villa located in the village of Payogan, just minutes outside of Bali’s arts and culture capital of Ubud. 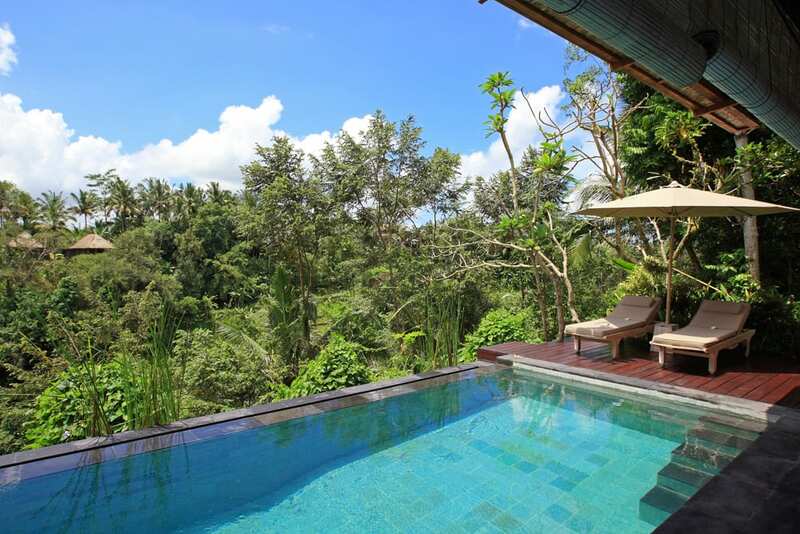 This tranquil 2-story, 1-bedroom luxury villa is the perfect spot for couples looking for a peaceful and romantic place to call your own during your holiday in Bali. 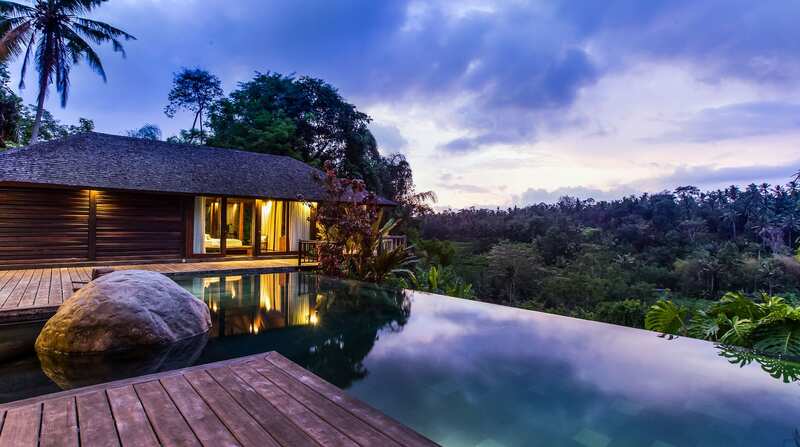 Villa Shamballa rests on a ridge overlooking the Wos River and is surrounded on all sides by lush tropical foliage. 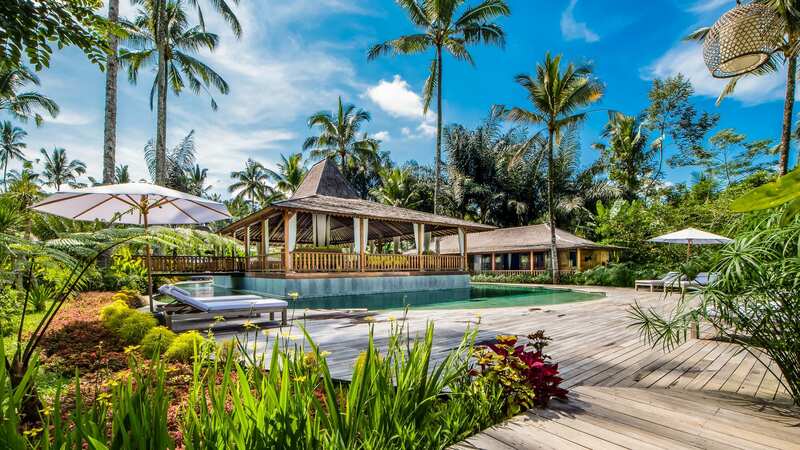 The villa itself is an appealing mix of modern day amenities and rustic exotic charm, with state-of-the-art electronics, appliances and fixtures, stylish yet comfortable furniture, a gorgeous private pool and covered dining pavilion and plenty of outdoor space to connect with nature. 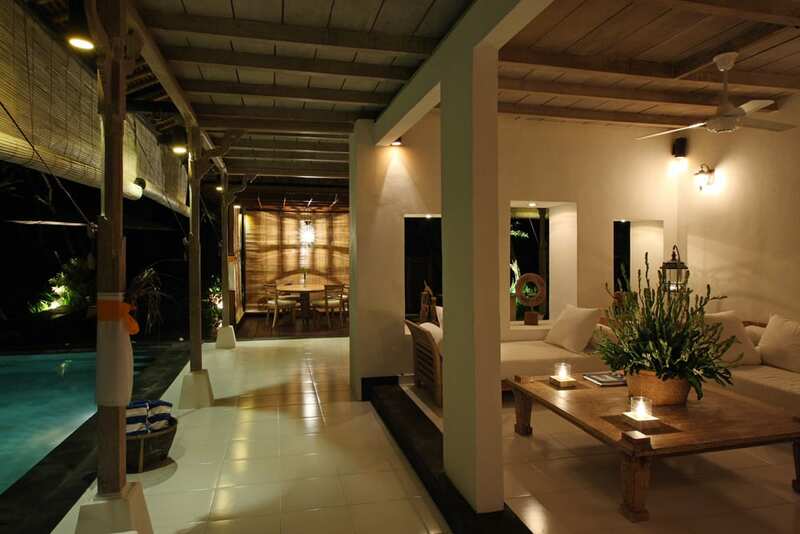 As you enter Villa Shamballa on the ground floor, you are immediately drawn to the chic indoor living room with its soothing natural wood accents and calming white decor. Large windows and open spaces in the walls allow the sunlight to filter in and there is a large flat screen TV, DVD player, CD player and plush sofas to settle in and enjoy some entertainment. From the living room you can head outside to the clear turquoise infinity pool for a swim, or to one of the two wooden decks that flank the pool for some fresh air. There is also a covered dining pavilion outside next to the pool, so you can enjoy your meals looking out over the river valley or dine under the stars. 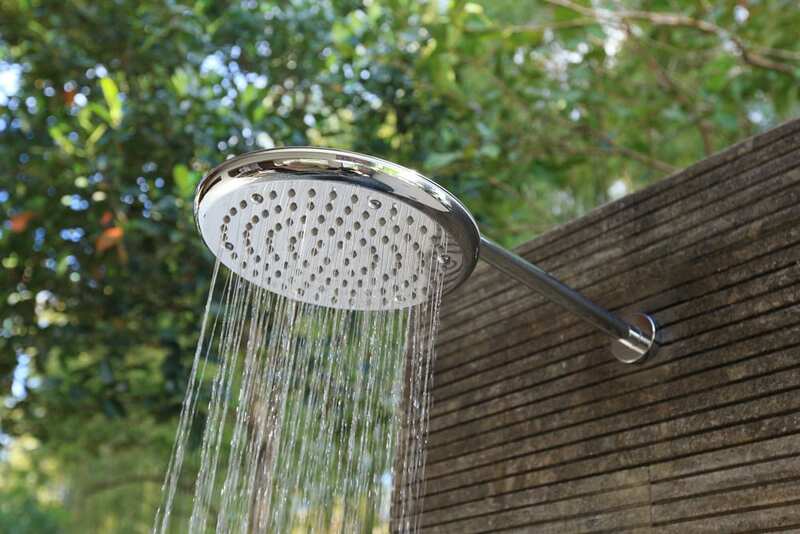 On the ground floor you will also find the main bathroom, a beautiful mixture of indoor and outdoor space with a large terrazzo bathtub and a rain shower that are open to the gentle breezes, yet still secluded for privacy. Guests are supplied with natural aromatherapy products, including one complimentary bath bomb, as well as high-quality towels. The second-floor bedroom is where you can really kick back and relax. 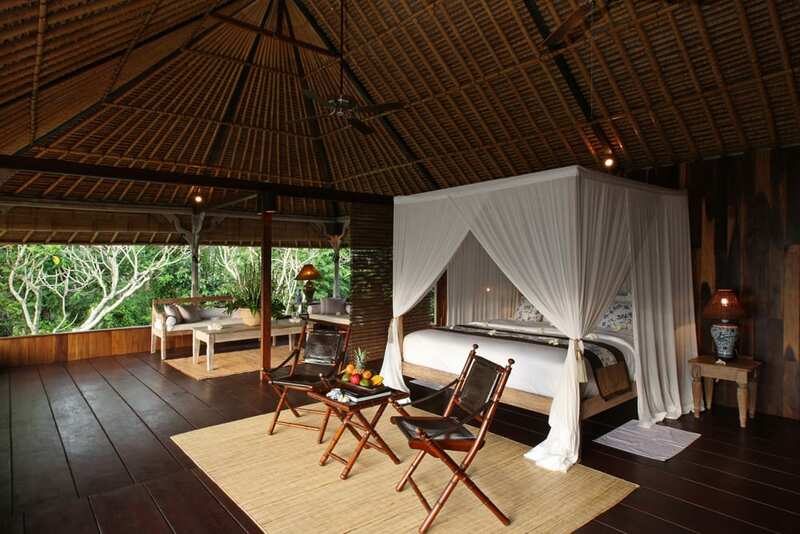 This spacious room has a soaring thatched roof, large windows that open to the treetops and offer views of the surrounding jungle, a comfortable lounge area with two teak daybeds, a sofa, coffee table, and iPod dock, and a lovely four poster king-sized bed set back from the lounge area with superb mattresses and pillows and fine Egyptian cotton sheets. 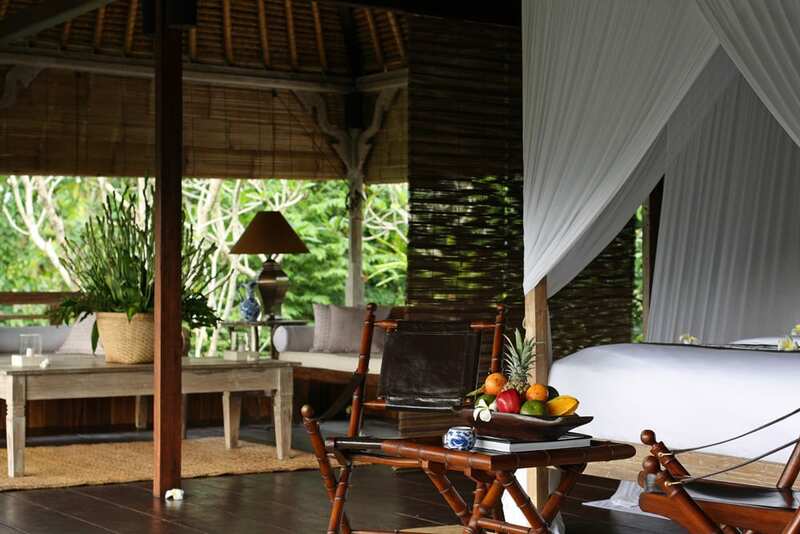 The entire room is decked out in a colonial theme, with wooden floors and furniture, Chinese lamps, batik cushions and a mosquito net draped like a canopy over the bed. There is also a coffee and tea making station here for guest’s convenience and ensuite bathroom and dressing room. LIVING AREAS 2 Indoor living rooms, outdoor dining area, outdoor wooden deck for yoga, meditation and afternoon tea, infinity pool. POOL 4 x 9 m, private infinity swimming pool. TRANSPORT Car and driver can be arranged at additional cost. 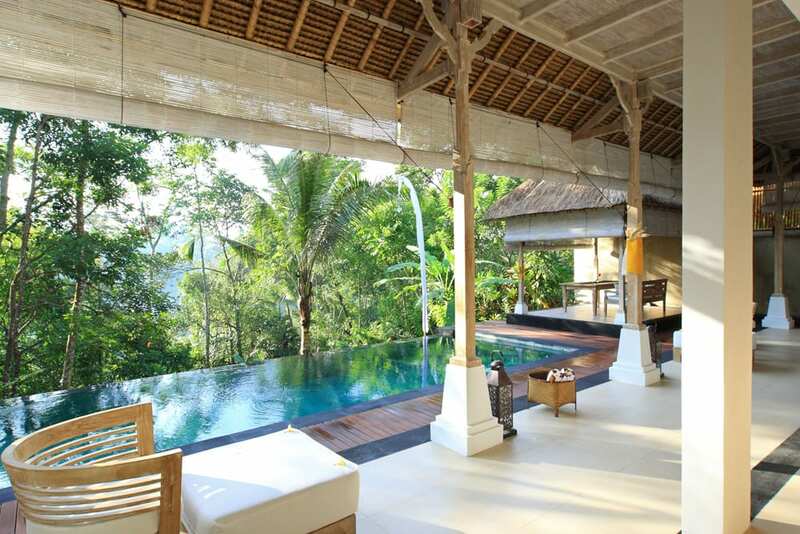 Villa Shamballa is very conveniently located in a small traditional village called Payogan whose meaning is “place to do yoga”. 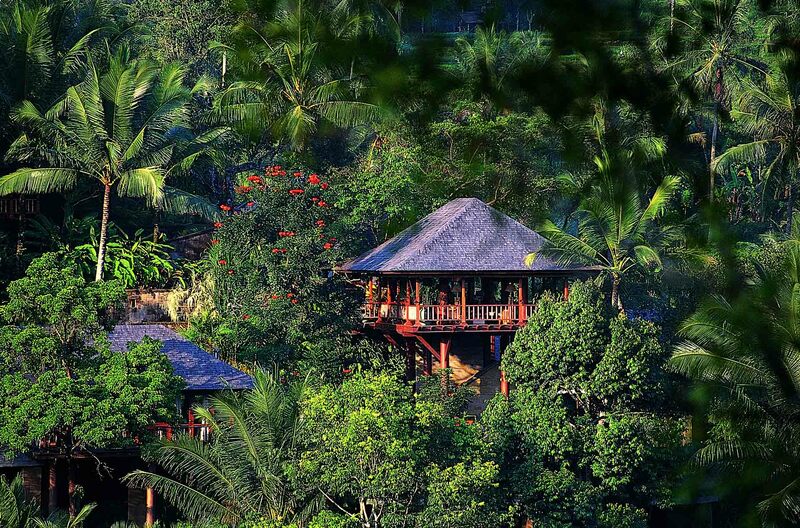 Although just 7 minutes drive from the centre of Ubud one senses they are miles away in the middle of a tropical forest. This hidden gem allows you to experience seclusion whilst remaining a stone’s throw from all conveniences. We stayed 3 nights and wish we had of stayed more. The staff were amazing, the pool divine and villa lighting and furniture was special. Lovely bathroom outside with a big tub. Eating in while the chef cooked was a treat and waking to the view upstairs was spectacular. We can't wait to go again. 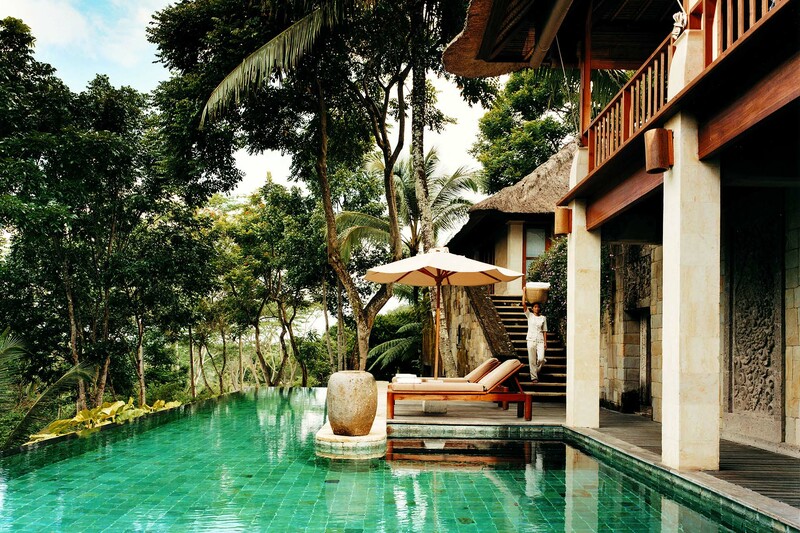 We went to Ubud a few times and couldn't wait to get back to the villa. It's really something special. We had a pick-up to the villa (must do because not everybody can find it! ).We walked in the villa after a long flight and thought we might see a reception desk. Then we saw the view over the valley and it turns out to be our villa...... No words can describe it. A beautiful and big place to stay with a beautiful and romantic view!! The service is just perfect, they will make anything the way you like it. Illuh and Dewa are perfect hostesses and cooks! They are always nearby to serve you in anyway, but they are never to much present which is a good thing. 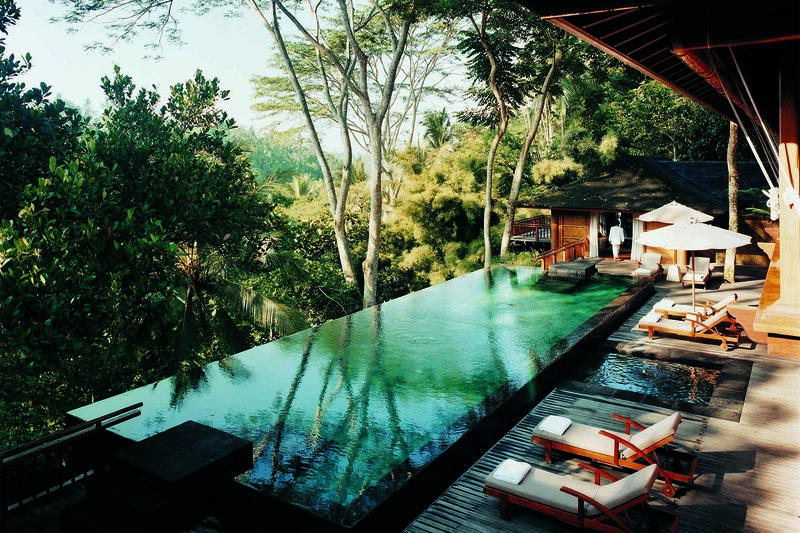 Because it is so beautiful we almost forget to see something of Ubud :). The villa is just like the pictures, could you imagine? It is all open, but very clean. Illuh, we still miss your pancakes! 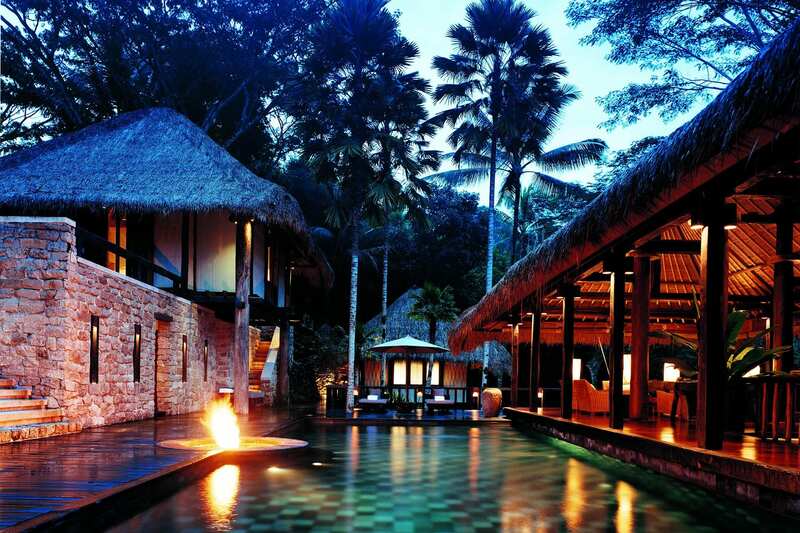 We could not be happier with our choice of honeymoon accommodation in Villa Shamballa. 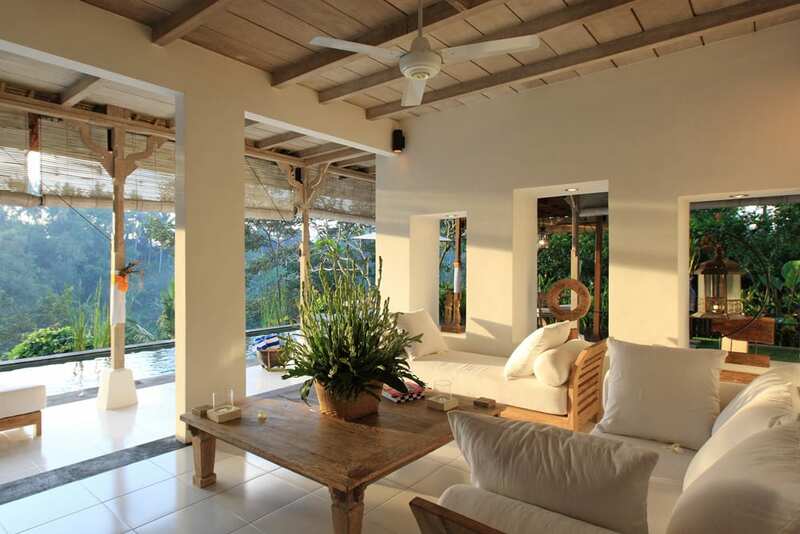 This beautifully designed villa with stunning views exceeded our expectations as we spent five days living in an exhilarating balance between romantic luxury, peaceful seclusion and a striking closeness with nature. 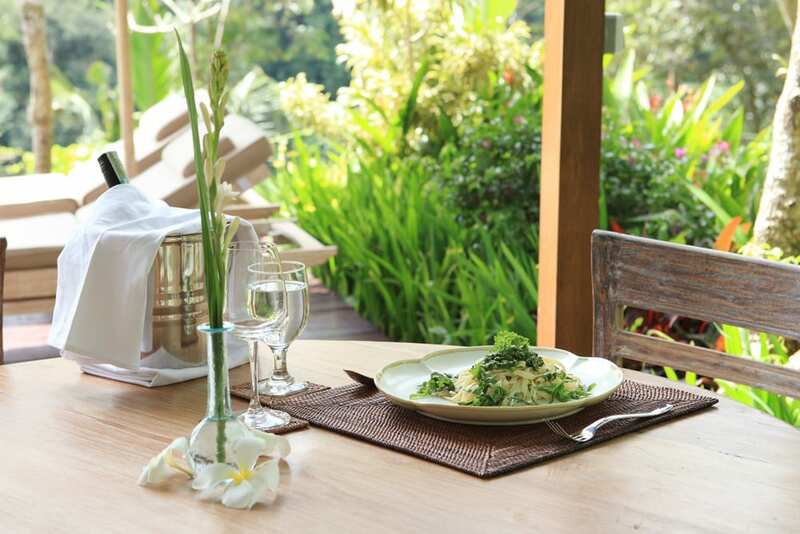 The lovely staff made sure that this stay was one that won't ever be forgotten, especially when it came to the in-house 3-course dinner, which was one of the best meals we have had in Ubud. 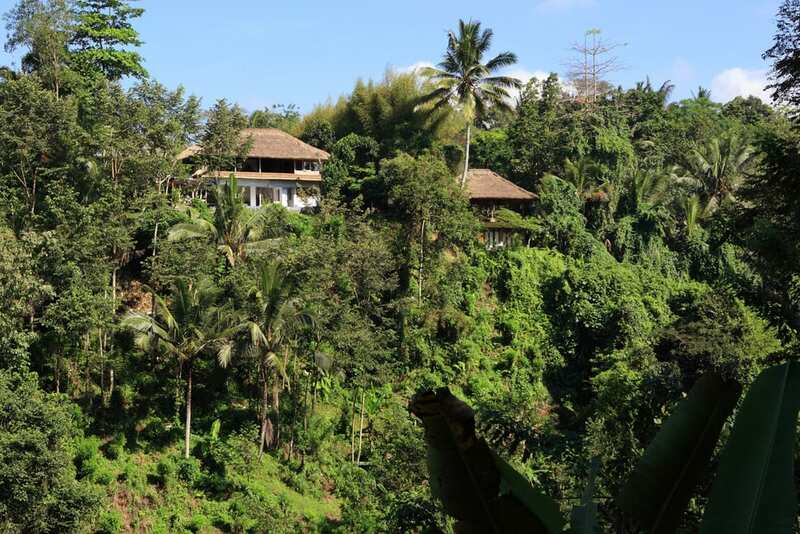 Stayed at Villa Shamballa in April 2013 as was picked up at the airport, driver had a cool towel and drinks for the 1 1/2 hour drive to Ubud. We arrived and were welcomed by Iluh who took our bags upstairs. We were given a refreshing cocktail and relaxed by the pool to catch our breath, the view was amazing "Paradise in Paradise". Infinity pool over looking the jungle took our breath away. 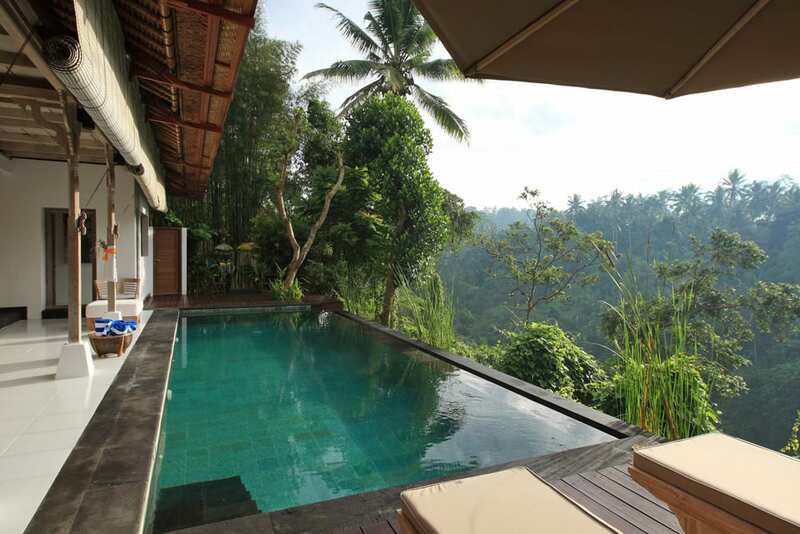 We soon unpacked and were taken to Ubud markets only 10 mins away after returning we were able to relax at the villa. Staff are amazing and are at your call whenever needed. Dinner was prepared and was also amazing. Upstairs was the bedroom which was very comfortable with joining ensuite. I cannot fault anything from the Villa and would highly recommend to everyone.